Exclusive to Absolute Koi these carefully engineered Digi-Flow meters include the very best features and provide outstanding performance. The Digi-flow Unit is a digital flow meter and will give you the actual water flow with a easy to read 6 digit LCD reading in Litres per minute (Lpm). Those of us in the koi industry know how important it is to know the true flow rate of our koi ponds, the flow rate is just as important as the filter itself. The Digi-Flo meter, due to modern technology, advanced plastics and metals, solid-state circuitry gives you the flow accurately to within 1%. Today’s Digi-Flow meters use advanced solid-state circuitry that operates on common batteries eliminating the need for electrical connections. The technology has advanced to the point where batteries last for a minimum of one year. When the batteries are replaced, no harm is done to the factory settings. We have four different models available to suit different diameter return pipework and different flow range. Easy to install using standard PVC solvent weld glue. No added pressure drop to system. Easy to read 6 digit LCD, up to 4 decimal positions. Battery operated (2 AAA batteries included). Factory calibrated - nothing to program. The meter can be mounted on horizontal or vertical runs of pipe. Mounting at the vertical (twelve o'clock) position on horizontal pipe is recommended. Mounting anywhere around the diameter of vertical pipe is acceptable, however, the pipe must be completely full of water at all times. 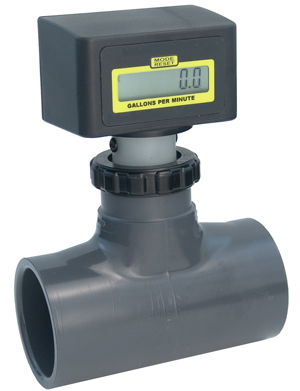 The meter can accurately measure flow from either direction. The meter is designed to withstand outdoor conditions. A cool, dry location, where the unit can be easily serviced is recommended.